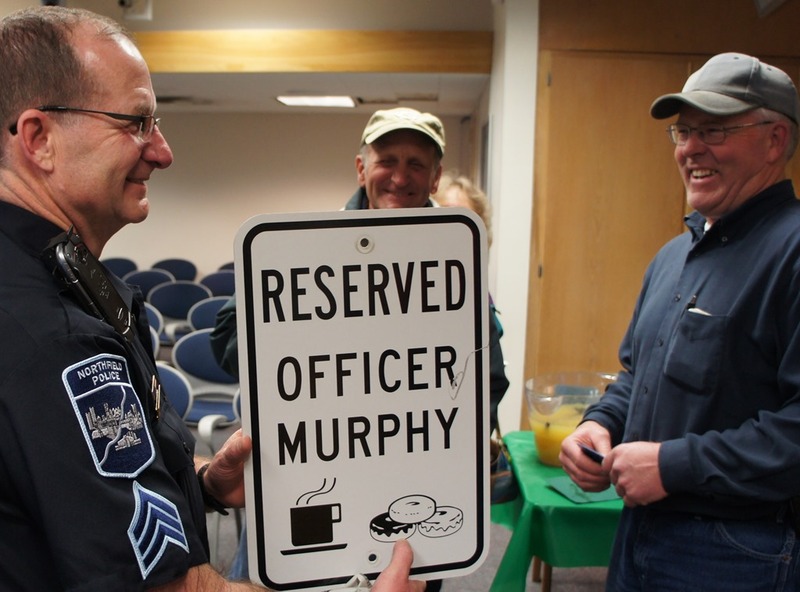 Many Northfield area well-wishers and maybe a few of the occasionally arrested turned out for Northfield Police Sergeant Mark Murphy‘s retirement party at Northfield City Hall Council Chambers yesterday afternoon. 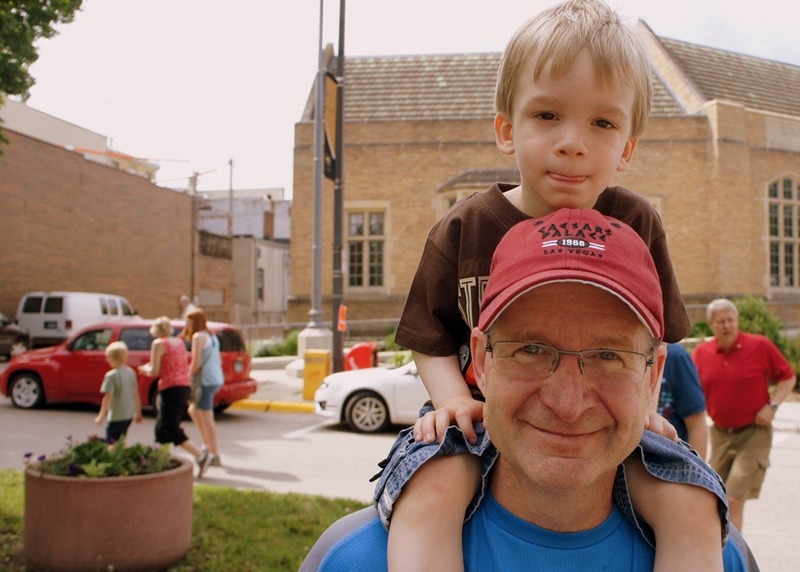 Mark Murphy, one of Northfield’s finest, retires today. Party on Monday. 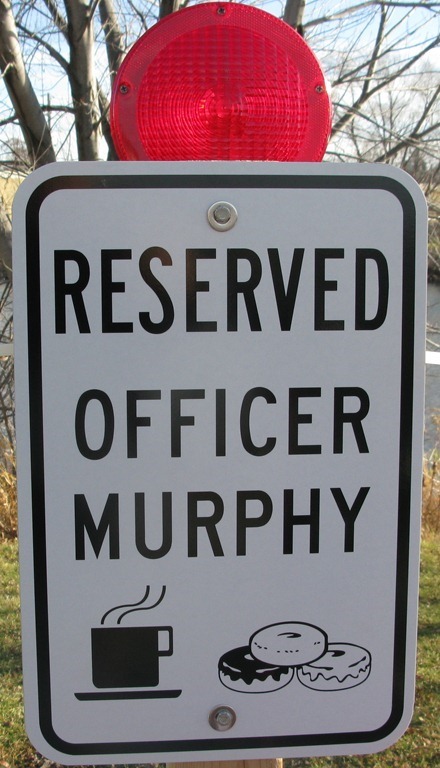 Interim Police Chief Chuck Walerius… invites the public to an open house for Murphy next Monday, April 22nd at the City Hall Chambers from 3pm to 5pm. There will be coffee and cake and a chance to say thanks to Mark for all his service to the community. Mark and I have a history. 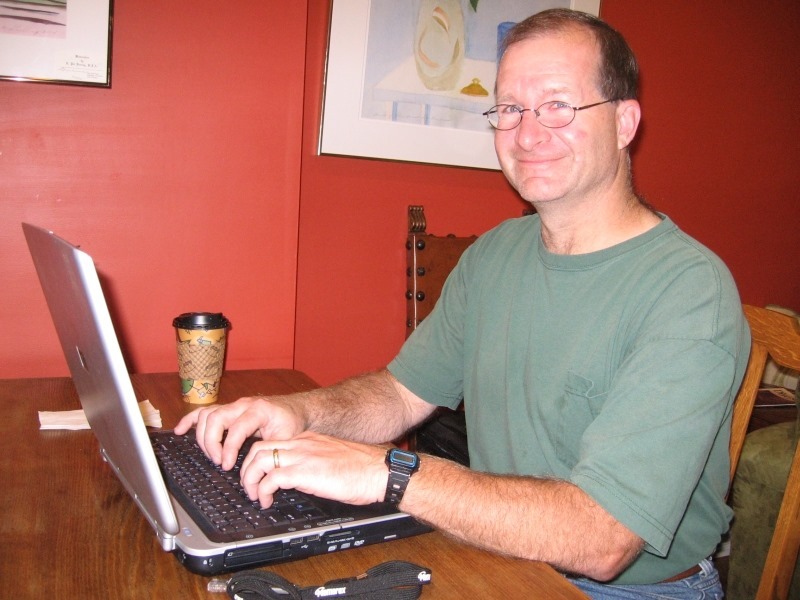 He hired me to help him with his campaign blog when he ran for Rice County Sheriff. Despite his loss, I was hoping that our professional relationship would be enough to have him look the other way whenever it might happen that I was observed to not be in full compliance with local traffic laws. Not so, it turned out. It´s been a long journey, but after he got his equity release on his house to see how much he could get for retirment, he decided it was time to hang up his badge after all this time. 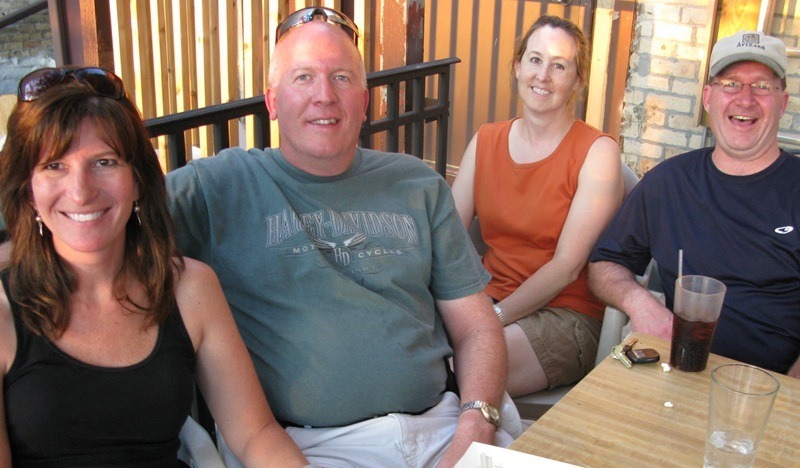 See all of my blog posts here on LoGro that have involved Mark Murphy. And then get down to City Hall on Monday afternoon to say goodbye. No need to be careful where you park. 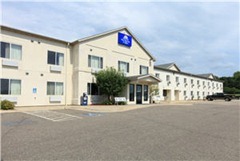 When the word of this morning’s robbery at America’s Best Value Inn & Suites on Hwy 3 began trickling out via police scanners, most Northfielders were sound asleep. 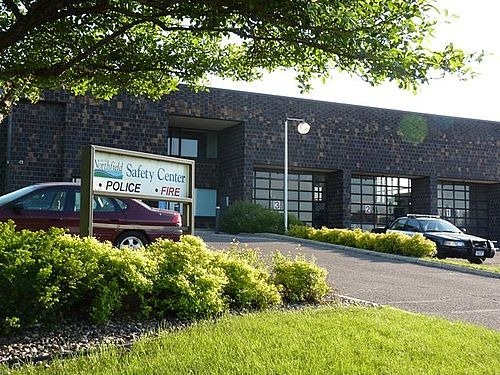 When KYMN Radio and Northfield Patch began sounding the alarm at around 6 am that one of the suspects had fired at police officers and fled, members of the Northfield Police Department assumed that citizens would respond in droves to help capture one of the suspects who was still at large and believed to be in the Sechler Park area. I exited the Goodbye Blue Monday yesterday morning at about 7:30 and, as always, paused and looked both ways before crossing the sidewalk (yes, the sidewalk) to check for anyone biking, as I was almost hit a couple of years ago. I then walked between two parallel parked cars, paused and looked left to see if any cars were coming, took one step onto Division St. and was hit by a bicyclist going the wrong way. ‘Hit’ is an exaggeration. As the young woman skidded to a stop, her front wheel and handlebars just made light contact with my body. I don’t remember if she apologized but I looked at her and said "Do you realize you’re riding on the wrong side of the street?" She flatly said ‘yes,’ got back on her bike, and continued riding south on Division on the wrong side of the street. Two GBM patrons on the sidewalk looked at me and said something to the effect of "Wow, that was a close!" As I crossed the street towards my car, I noticed a Northfield Police car slowly coming south on Division. I motioned to the car and the officer pulled over and rolled down his window. "Did you see what just happened?" I asked. He smiled and said "Yeah, I saw that." I said "She needs to be disciplined!" He didn’t reply and pulled away. I wondered whether he was going to pursue her. I saw him make a right turn on 4th St.so I got in my car, turned right on 4th, saw that Water St was blocked because of people setting up for Riverwalk Market Fair and assumed that he drove across the bridge. I did likewise and then saw him on Hwy 3, turning right on 2nd. So I don’t know if he caught up to her to issue a warning but it was clear that he didn’t issue a citation. 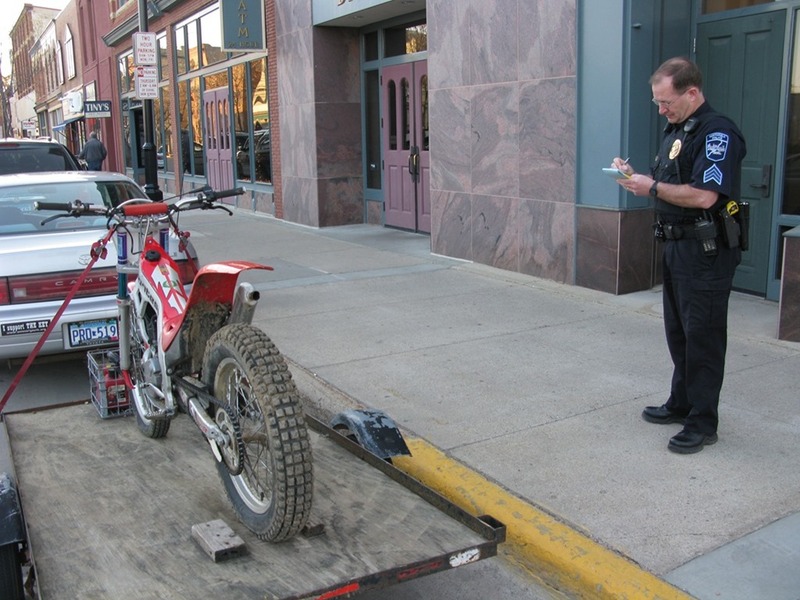 Back in July, I published a blog post titled Ticketing law-breaking bicyclists: if Edina and NYC can do it, why can’t Northfield? in which I cited the problem of bicyclists riding on the wrong side of the street. 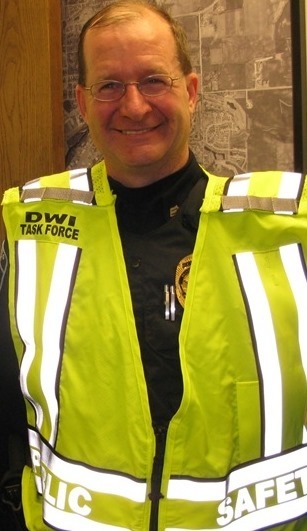 I was glad to hear from Mark Taylor, Police Chief/Director of Public Safety who said that they would stepping up bicycle law enforcement. It’s perplexing to me why this cyclist was not issued a citation but I’ll see what I can find out. Later in the day when I was telling Robbie about the incident, it occurred to me that I should have asked the bicyclist why she was deliberately riding on the wrong side of the street. My guess is that she would have cited her fears of diagonally-parked cars on the west side of Division backing out into the street and running into her. 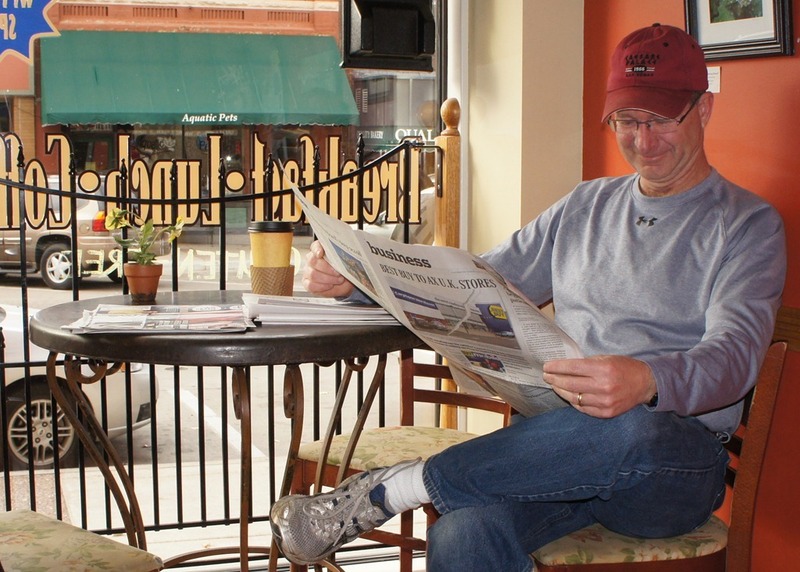 And that’s something I wrote about back in early July, How to make bicycling in downtown Northfield safer and more popular? 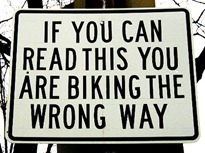 Sharrows might work. 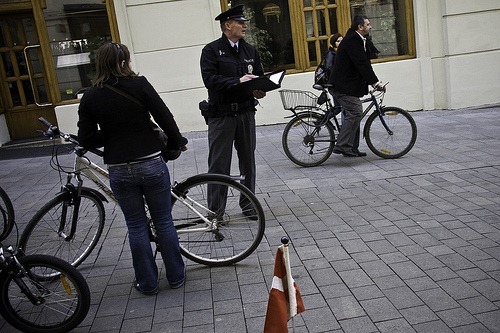 And see this Sept. 2011 NY Times article: Study Finds Higher Number of Pedestrians Hurt by Bikes. More than 500 New York City residents are injured badly enough to be treated in hospitals after being struck by bicyclists each year, according to an analysis by Hunter College professors… Dr. Tuckel, a sociology professor, said these figures represent “the tip of the proverbial iceberg” because they only include pedestrians who wound up in the hospital. They do not include victims who visited their doctor’s office or a walk-in clinic for treatment. For those of you snickering: 1) no, I’m not yet suffering from PTSD and expecting the City to provide me with CISD services; and 2) yes, it would have been more than a little ironic if she’d crashed hard into me and then cracked her skull on the pavement because she was not wearing a helmet. 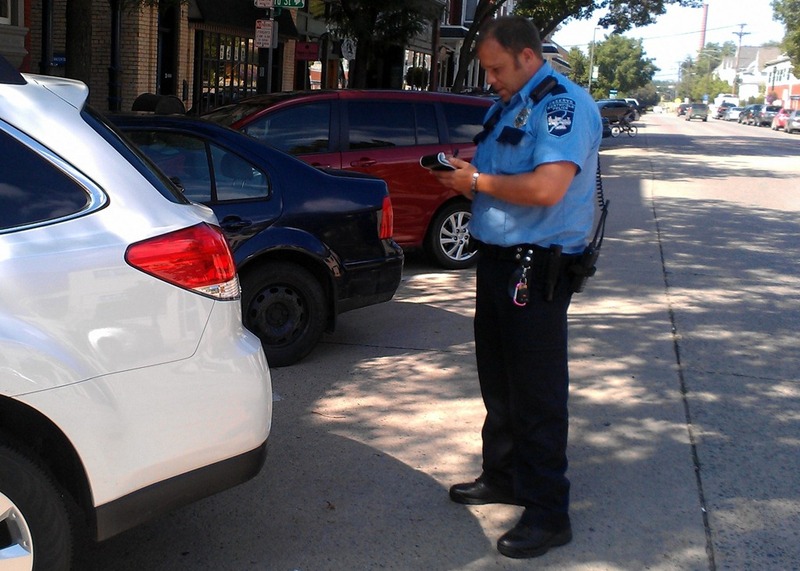 A community service officer intern for the Northfield Police Department was issuing parking tickets this afternoon along Division St. He said he written up over a dozen in a couple of blocks. In May of 2011, I blogged: Do we need a downtown parking hall of shame? No real progress since then, evidently. But it makes me glad that the City Council hasn’t approved the Streetscape Task Force’s request to spend $700,000 for another parking lot. The NDDC, the Chamber, and the Streetscape Task Force need to tackle the problem of chronic downtown parking violators first. 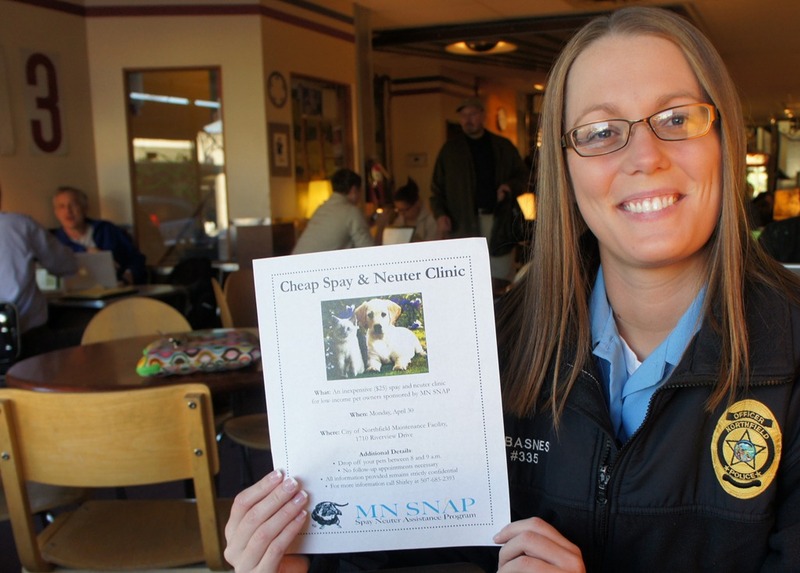 Sheena Basness, Community Service Officer with the Northfield Police Department, stopped by my corner office at GBM last week to tell me about a cheap spay/neuter clinic on that’s coming to town on April 30, hosted by the Minnesota Spay Neuter Assistance Program (MNSNAP). See the Spay and Neuter flier in English and in Spanish. You must pre-register. Call Shirley Taggart at 507-685-2393 to reserve a spot. Sheena said there would also be some vet services available for a fee. See the image on the right. More at Nfld Patch: Reduced-Price Spay and Neuter Clinic Coming to Northfield. Low-income families and individuals will have any opportunity next week to get their pet spayed or neutered at a reduced cost. “This is the first time for us doing anything like this,” said Sheena Basness, a Northfield community services police officer involved in the clinic. The clinic costs $25 for each pet that is spayed or neutered. The visit also includes a basic checkup. A basic neuter usually costs about $150 and a spay costs around $200, Basness said. Robbie and I were returning from the Cities on Hwy 19 about 9 pm on Saturday night and noticed that the car in front of us was swerving erratically. When it crossed the centerline by about 3 feet with oncoming cars, we decided to report it via a call to 911. Robbie gave the dispatcher (at the Pearl St. 911 Dispatch Center in Owatonna) the license plate #, car description, and our location and description of our car. 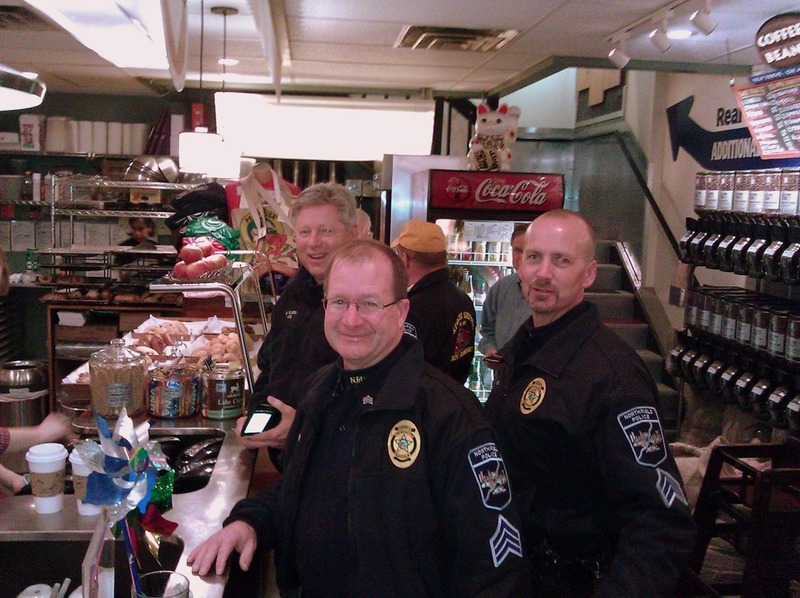 Within a few seconds, they handed us over to a dispatcher in Northfield. As we entered Northfield, the dispatcher asked us if we were willing to continuing following the car, which turned out to be convenient as it was taking the same route as we were. A Northfield Police Department squad car spotted us just after Jefferson Parkway and Hwy 3 and shortly afterward, followed the car into a neighborhood nearby. Was the driver intoxicated, tired, on a cell phone? No clue. But we felt good that we’d done our civic duty and were pleased with the response by the local law enforcement people on duty.